No matter which side of the spectrum you sit on, it’s undeniable that we are living in politically tense times (which might be the understatement of the century). Everything from snide comments, to political agendas, to hidden meanings are being questioned. The food and beverage industry is no stranger to unsavory and distasteful (puns completely intended) advertisements and campaigns. When an ad of that nature surfaces — be it in print, digital, television, even audio — the same forehead-slap-inducing sentiment can be felt round the world. On the chopping block this time is Kellogg’s. 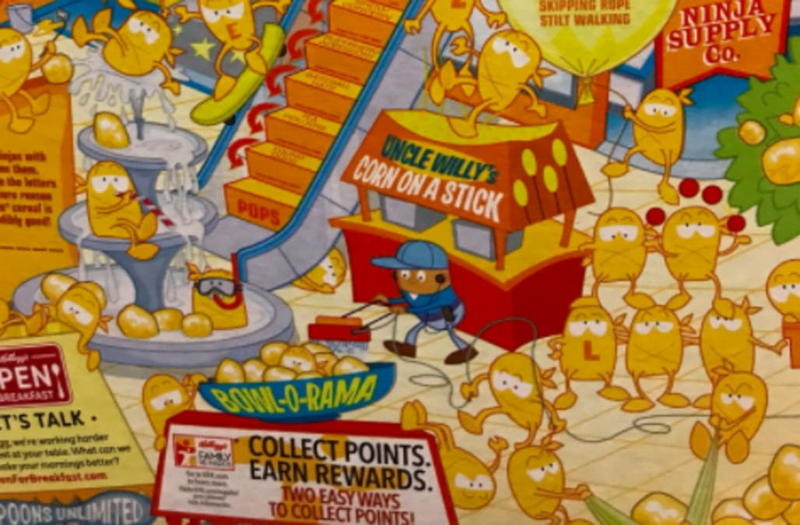 The box depicts dozens of the same-colored pops jumping around and performing various activities — except working. Ahmed then included a zoomed in image of the one working pop — a janitor — that is very clearly a different, darker color than the other pops. @KelloggsUS Thank you for doing the right thing and making a simple but profound change to your cereal packaging. Gotta have my Pops! @saladinahmed @KelloggsUS The small things add up. This is wrong on so many levels. Glad you’re making it right. @saladinahmed This is not a tiny thing. This was completely deliberate. @saladinahmed It's a tiny thing, but it's also a very consistent, subtle, message across this country. A general rule of thumb to be learned here: If there’s any doubt that anything being published might come across as insensitive or racist, maybe, just, don’t do it? Though we’ll never know whether or not the advertisement was intentional, it’s safe to say this illustration snap, crackled and popped right in Kellogg’s face — and not in a good way. Why people trust it: Betty Crocker baking products are staples in most American households. Why people trust it: Kraft committed to stop putting artificial ingredients in its macaroni and cheese this year. Why people trust it: The company claims its products have strong flavors and that they're easy to drink. Why people trust it: All Minute rice products are grown in the US. Why people trust it: Hellmann's Real mayonnaise is made with just three ingredients — vinegar, eggs, and oil. Why people trust it: The brand is authentic. The products the company manufactures in the US are made with the same machines as the products made in Italy. Why people trust it: Wonder Bread has been a classic household name brand since 1921. Why people trust it: Hershey's is the leading manufacturer of chocolate, mint, and gum in North America. The company is transparent about its ingredients. It primarily uses milk, almonds, cocoa beans, and sugar in its products. Why people trust it: JIF sells a variety of peanut butters, including reduced fat, low sodium, and more. Why people trust it: Old El Paso offers a complete line of Mexican meal components that are common in many households. Why people trust it: According to Campbell, 95.8% of households have a Campbell product in their kitchens. The company believes its popularity is because of its transparency. Why people trust it: Land O'Lakes claims that its simple ingredients have set the standard for quality butter since the 1920s. Why people trust it: Trident gum is known for its claim to clean and protect teeth. Why people trust it: Tropicana's orange juice is rich in nutrients, and advertises that its products go from "grove to glass." Most of its juice products have an impressive 100% daily value of Vitamin C.
Why people trust it: Heinz ketchup has been free from artificial preservatives since 1906. Why people trust it: French's mustard is America's number one brand for mustard. It's committed to using simple and clean ingredients. Why people trust it: McCormick is known for producing many popular and unique spices. The company also offers low sodium and gluten-free options. Why people trust it: Breyers, which is owned by Unilever, is committed to selling products with "All-American dairy" and "naturally sourced flavors and colors." Why people trust it: Silk produces multiple dairy-free products including soy milk, cashew milk, dairy-free yogurts, and almond milk. Why people trust it: Coca-Cola includes Diet Coke, Coke Zero, Sprite, and Fanta soft drink products and is transparent with its ingredients.